SXSW is here again, and as usual, Future of Music Coalition staff and board are well represented at America’s biggest music conference. Amidst the BBQ, margaritas, and awesome music, we encourage you to make time to check out these can’t-miss panels and sessions featuring your favorite FMC superheroes. South By Southwest is here again, and as usual, Future of Music Coalition’s staff and board members are well represented at the industry’s biggest annual conference. Among all the breakfast tacos, margaritas, and above all, awesome music, we encourage you to make some time to check out these can’t-miss panels and sessions where FMC staff and board members will be speaking. Even though summer is still in full swing, we’re already looking ahead to 2015 and our annual springtime sojourn to Austin for the South By Southwest annual music, film, and interactive conference. It’s always a jam-packed week of great music and important conversations, and we’re excited to be part of the action once again. Every year, SXSW offers the public a chance to weigh in on the kinds of programming choices they’d like to see at the conference through their PanelPicker online tool. There’s a lot of great proposals to choose from; below, we’ve got a handful of panel proposals for which you might consider casting a vote. South by Southwest 2014 is just around the corner, and as always FMC will be well-represented at the event with collaborations, presentations and of course, rocking out! The team will be all over the music festival and some of the interactive festival. FMC staff, boards and buds will cover pretty much every aspect of today’s music biz on panels, presentations, meet ups and even a film. Get expert advice on health-care issues with Hannah Byam (Events & Special Projects at FMC) and other professionals at “Artists and the Affordable Care Act: Get Answers, Get Covered,” a drop-in workshop focusing insurance and health care for musicans on Thursday, March 13th from 3:30-6. Interim Executive Director, Casey Rae will moderate a panel exploring the latest approaches to copyright protection online. “New Adventures in Copyright Enforcement” takes place on Friday, March 14th from 2-3:30. … and if you’re headed to SXSW Film, you can see our Director of Programs Jean Cook performing in the music-film, Pulp, on Wednesday, March 12th at 7 pm. Read on for the full schedule of appearances and visit our SXSW page for a full detailed list of events to look out for. Michael Bracy will be hosting an official panel called “Navigating Washington in 2013” featuring FCC Commisioner Jessica Rosenworcel. The panel takes place at 5 pm on Wednesday. 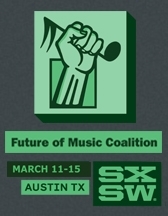 This is an exciting opportunity for SXSW attendees to connect with influential policymakers and get an inside view of how the policies that impact musicians are made. Jean Cook will join Brian Zisk as a panelist on the topic of “Fair Play: Music Startups and Artists” on Tuesday at 5. We’ll also be helping Brown Paper Tickets kick off their “Make Radio Challenge” with tacos, bloody marys, and some amazing artists and activists talking about the awesome opportunities offered by Low Power FM, starting at 11 AM on Tuesday. And if you’d like to just meet up with FMC staff for drinks, Michael Bracy & Jean Cook will be hanging out at Ginger Man Thursday evening (with music curated by Jon Langford). Read on for the full schedule of appearances by FMC Staff, Board, and Advisory Board members! Mythbusting Part 4: Are Bands Monetizing their Brand?